It's August and time for our region's one-day drivers education event at the world-class Road America track. We also have a car show (it's free), a picnic, autocross, Porscheplatz at Road America during the ALMS race weekend, and the Milwaukee Masterpiece this month. Join us. Aug. 4 – Car show at VA Center. Free. Details here. Aug. 4 – Summer picnic. Town of Lisbon (Waukesha County). Family fun. Traditional picnic food and beverages. Join us. Details here. Aug. 5 – Cars and Coffee, Lake Mills. Always the first Sunday of the month. Incredible cars from around the region. Incredible car people like you. Details here. 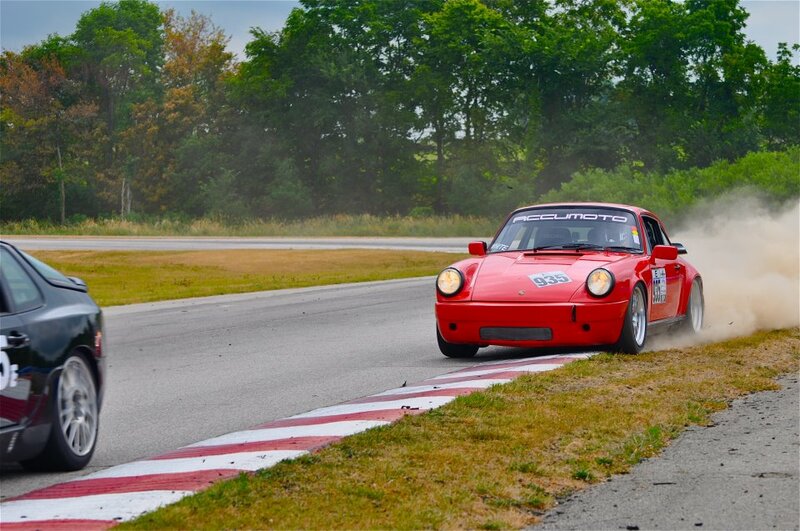 Aug. 10 Driver Education (DE) at Road America. Drive your car in a controlled, safe environment. Novices are always paired with an instructor for the day. Details here. Aug. 12 – Autocross at Miller Park. 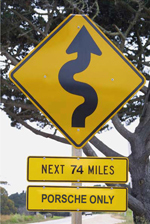 This is a slow-speed driving activity as you navigate a course marked with safety cones. Details here. We need help with set up early in the morning of this event. Can you help even if you don't plan to run in the event? Aug. 17 – Porscheplatz at Road America. No, Porscheplatz isn't a German band. 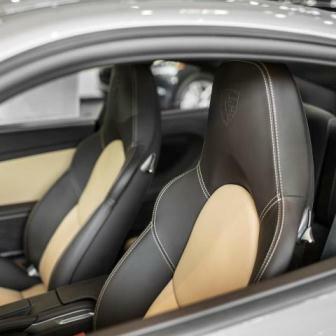 It's an event unlike anything you've enjoyed before with your Porsche. Details here. Aug. 25 – 26 - Milwaukee Masterpiece. Big car show at Milwaukee's lakefront. The finest in automotive excellence will be there. Details here. Sept. 2 -Super Cars & Coffee Concours on the Green - Lake Mills. This is the Super Cars & Coffee, a concours d elegance in Lake Mill's Commons Park. Register by Aug. 27 to enter your car. Details here. Oct. 6 - Fall driving tour. This will be a half-day tour, in the morning. Starting location and time to be announced soon. Stay tuned. Save the date for another classic driving tour hosted by Jay and Lee Heppe. Board meetings – The first Thursday of the month. Members are always invited to pull up a chair, order a beverage and enjoy the conversation. We also welcome James Hall, Milwaukee, who transferred from the Chicago Region with his 2000 Boxster S.
Bob Budecki and the family dog Case love their Boxster S.
“I've been interested in a Porsche Boxster for a couple years and Al Wagner, Bill Wright and Michael Bolton all have helped refine that interest,” said Robert Budecki. “Through the kindness of Bill Wright, I drove his Honda S2000 in an autocross event at Miller Park and again at a Road America DE event (the results of which are best left unsaid). 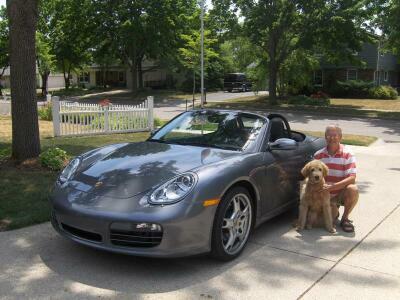 After securing “home approval,” he began a serious search for a Boxster S in 2012. He searched both private owner as well as dealer listings. He found a 2006 Boxster S Model 987 in Maryland with gray exterior, black interior at CarMax's website. It was listed as one owner with under 14,000 miles. “I talked at length with the salesmen - Jeff Benson & Matt Kivell - who provided an AutoFax report and I found the car passed all my phone queries. He bought the car on June 7 and “have been thrilled with its feel and performance. American Family Insurance would not cover any DE days, so I insured instead with Erich Olson at Liberty Mutual. I'm looking forward to the Milw Region's social events and track days plus getting to know more of its members,” he said. Bob is a retired sales executive; his wife is a retired second grade public school teacher. His interests include “duck carving; yard work; traveling; reading; and grandchildren.” Bob and his wife have three grown and married children and six grandchildren all living in the Cedarburg area. 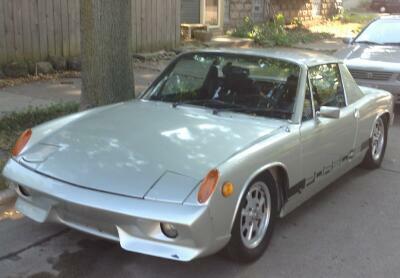 Meet Nathan Kirschner who drives a slightly modified 1973 Porsche 914 2.0. It’s his first Porsche and he’s the second owner. It was originally owned by his father. “I inherited this car when my dad passed away in December. He was from Fond du Lac and purchased it somewhere near Milwaukee in the early '90s,” Nathan explained. “He was a person who did everything for others - this car was his only splurge for himself. “He used to bring me to school in it when I was a kid (before putting it away for the winter, of course), which was awesome, and it was the car he used to teach me to drive a stick shift. I'll never forget that day. Nathan, an attorney, hopes to participate in social events and tech sessions. If you were there, enjoy the event again when you review these links. If not, see what you missed and plan to join us the next time around. July 14 --Drive to Elkhart Lake for Road&Track Concours. Photos here. Hawk at Road America -- Vintage road racing was the order of the weekend. Photos here. BoxsterS launch party at Concours - Concours Motors showed off the BoxsterS at a launch party recently. Photos here. Millers at Mile - Read about the event and check out some photos of vintage racing machines here. The region's classifieds are updated dynamically. When a new ad is submitted, it's added to the page so check it often. You don't have to wait until the newsletter is published to see the ads. Check them out here. Porsche Cars North America, Inc. (PCNA), importer and distributor of Porsche sports cars, Cayenne SUVs and the Panamera four-door sports sedan line-up in the United States, announced July 2012 sales of 2,803 vehicles. This compares to 2,768 vehicles sold last July, for an increase of one percent. For the year, Porsche has sold 19,253 cars in the U.S., a five percent increase over last year’s sales of 18,310. Porsche sold 359 Boxster models in July, a 77 percent increase over July 2011. July was the first full month in which Porsche offered the all-new, 2013 Boxster models. Porsche's Approved Certified Pre-Owned vehicle sales were 775 for July 2012. Year-to-date, Porsche has sold 5,631 CPO models, a ten percent increase versus 2011. (5,142). 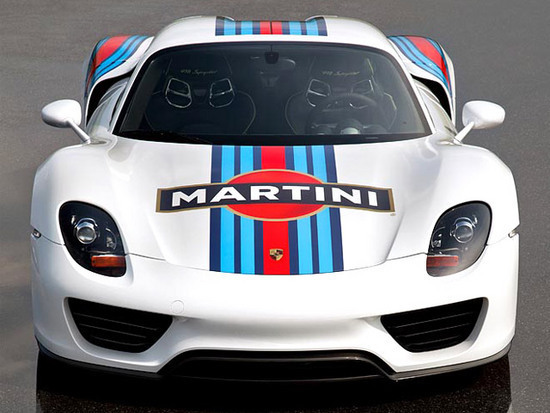 Check out this news release from Porsche about the Martini 918 Spyder. Read the photo story as PCA member logs his round trip drive to Salt Lake City for the 2012 Parade. Check it out here. Mark White of Accumoto Motorsport kicks up a little dust and a lot of fun at Putnam Motorsports Park. Photo credit Bill Altvater.